My new hip scarf arrived in all it's lavendar glory yesterday. This coming Friday, we're having new class pictures taken for Claire's web site, so I couldn't be more pleased. I want my bellydancing body to look it's best :) I got this hip scarf for a really good price from a third party vendor on Amazon. I prefer velvet hip scarves, since they tend to stay up on my hips better, but this one was just so pretty, and I like how it's a longer, triangular shape, which normally cost much, much more. 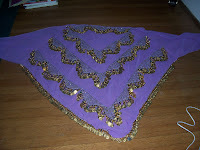 My original "training" hip scarf is also chiffon; it's a dark green with silver coins in straight rows. That hip scarf has served me well, but there's something funky going on with it. For the life of me, I can never get it to look right when I tie it on. It always scrunches up and ends up looking like I have random loose change stapled to my backside. Not a good look. And my velvet one is losing coins at a distressingly rapid clip. It's becoming a bellydancing biohazard. Anyway, the coins and beads on this new one are multi-color and irridescent, and I couldn't be more pleased. I put it on and shook around the guest room a bit to try it out; it worked well. Hank, of course, was transfixed, and tried to tackle it (it seems that little boys know how to tackle instinctively, from the time they're in the womb). I'm looking forward to Friday. As well, on Friday, I've been invited into the inner circle of the performance group - a coveted invite to the post-class gathering at a member's house for a glass of wine. I couldn't *possibly* be more excited. Bellydancer sisterhood is surrounding me like a chiffon veil and I'm a happy, happy girl.